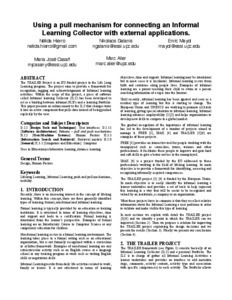 Hierro, N.; Galanis, N.; Mayol, E.; Casany, M.J.; Alier, M.
The TRAILER Project is an EU funded project in the Life Long Learning program. The project aims to provide a framework for recognition, tagging and acknowledgement of Informal learning activities. Within the scope of this project, a piece of software called Informal learning Collector (ILC) has been developed to act as a binding between informal PLE's and a learning Portfolio. This paper presents an enhancement to the ILC that changes turns it into an active component that pulls data instead of being pushed explicitly by the user. Hierro, N. [et al.]. Using a pull mechanism for connecting an informal learning collector with external applications. A: Technological Ecosystem for Enhancing Multiculturality. "Proceedings of the 1st International Conference on Technological Ecosystem for Enhancing Multiculturality". Salamanca: ACM, 2013, p. 225-229.